House Democrats are staging a sit-in over a gun control vote. Here’s where your Colorado representatives are. - Denverite, the Denver site! House Democrats are staging a sit-in over a gun control vote. Here’s where your Colorado representatives are. Ed Perlmutter is there. Diana DeGette is there. So what’s going on? Ed Perlmutter is there. Diana DeGette is there. Sen. Michael Bennet has joined them. 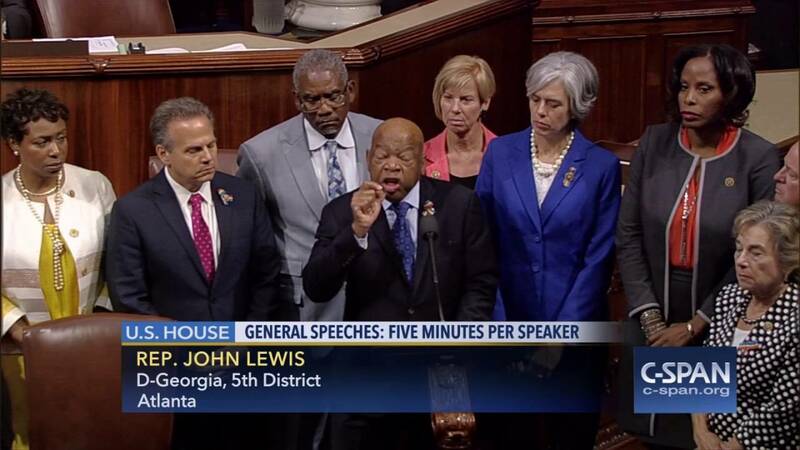 Led by Rep. John Lewis (D-Ga.), the civil rights icon, and more than 40 Democrats walked into the chamber just before noon and pledged to “occupy” the House floor until GOP leadership allowed a vote. Earlier this week, Senate Democrats failed to pass legislation that would have prevented suspected terrorists (those on the “no fly” list) from buying guns and would have expanded background checks. It took a filibuster just to get the opportunity to vote. Democrats in the House didn’t even get that far. You can’t watch the sit-in, though, because when the Republicans put the House into recess, the cameras went off. At least two of Colorado’s three Democratic representatives are helping to hold the floor. We’ve reached out to the office of Rep. Jared Polis, and we’ll update when we hear back. He hasn’t tweeted about it, though.